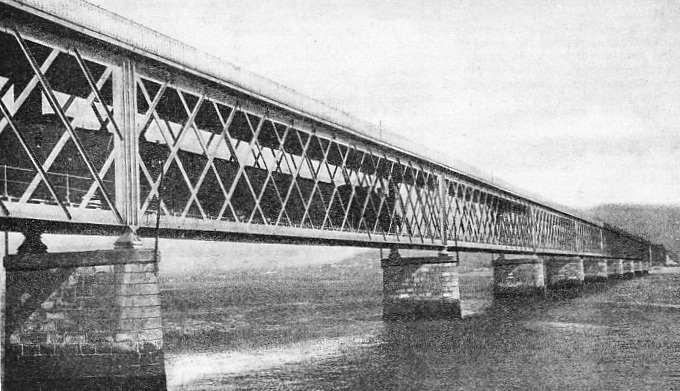 A STEEL BRIDGE OF FIVE SPANS at Ormaiztegui, 357 miles north of Madrid, which carries a section of electrified track of the lines of the Northern Railway of Spain. This railway, which was incorporated in 1858, has adopted a policy of electrification, and the Irun-Alsasua, Catalonian, and Pajares Incline sections have been electrified. The company owns some seventy electric locomotives. THE Iberian Peninsula, comprising Spain and Portugal, is distinct from the rest of Western Europe in many ways, including railways. The Pyrenees lie in the manner of a great wall across the neck of the peninsula. In countries as mountainous as Spain and Portugal narrow-gauge lines might be expected, but the gauge of the main lines is the broadest of all - 5 ft 6 in -and is found elsewhere only in South America and in India. The main lines of Spain will first be described. The railways began in 1848, and seventeen miles were open in 1850. By the end of the last century the route mileage was over 8,000, and this has since been extended to more than 10,000. The principal railway is the Northern Railway of Spain, although its mileage is nearly equalled by that of the Madrid, Saragossa and Alicante Railway. The Northern Railway of Spain operates 2,308 miles of 5 ft 6 in gauge, and sixty-two miles of metre-gauge track. The Madrid, Saragossa and Alicante Railway has 2,280 miles of 5 ft 6 in gauge. The Northern Railway operates the trunk line from Madrid, the capital of Spain, to Irun, on the French frontier, beyond San Sebastian. This progressive railway has electrified some of the severely graded sections in the mountains and various sections over which traffic is heavy. Because of the break of gauge there are no through trains between the two capitals of France and Spain. There are four stations connecting with the French railways. On the west is Irun, which links with Hendaye, on the Paris-Orleans-Midi system. The route through Irun, followed by the “Sud Express” between France and Spain, is the most important. Towards the centre of the Pyrenees is Canfranc, connecting with the P.-O.-Midi to Pau, via the Somport Tunnel (4 miles, 1572 yards). In the east is Puigcerda, from which another branch of the P.-O.-Midi runs north to Toulouse. On the east coast an important line of the Madrid, Saragossa and Alicante Railway runs from Barcelona to Port Bou, whence a French railway runs north via Cerbere and Perpignan to Narbonne and Sète. In addition to the trunk route from Madrid to the corner of the Bay of Biscay and France, the Northern lines extend to Corunna, at the north-west corner of Spain on the Atlantic coast, serving the cities and ports of the industrial north. Another line runs south of and roughly parallel to the Pyrenees, sending branch lines into the mountains, and crossing the country to the great city of Barcelona, on the Mediterranean coast. Another line, branching from the Barcelona route at Lerida, runs south along the coast of the Mediterranean to Valencia and beyond, linking with the Madrid, Saragossa and Alicante system. The main line of the Northern Railway runs from Madrid to Avila, Medina, Valladolid, Burgos, Vitoria, San Sebastian, and Irun, where it crosses the River Bidasoa by a bridge to Hendave, on the French side of the border. This double-track line is nearly 400 miles long, and is the main highway between Madrid and Paris. In France the line goes through Biarritz, Bayonne, Bordeaux, Angouleme, and Poiters to Paris. Probably no railway journey between the capitals of two adjoining countries is more interesting than that between Madrid and Paris. Spain has developed an individuality of its own. Its conquest by the Moors has left traces which remain to this day, and, in the south, the climate resembles that of Northern Africa. The area of the country is 196,700 square miles, and the population 22,940,000. Madrid, the capital, has about 993,700 inhabitants, and lies 2,165 ft above sea-level. Lack of space forbids a description of the city. It was taken by Alfonso VI in 1083 from the Arabs, who called it Magerit. It was raised to the dignity of a capital city in 1561. No sooner has the express for Paris left the Spanish capital than it begins to climb through the mountain chain of the Sierra de Guadarrama. Torrelodones, nineteen miles from Madrid, is a village at the foot of the mountains which rise above the plateau. From Villalba, twenty-four miles, a branch-line serves the quarries of Berrocal, while another, single-track, line goes to Segovia, rejoining the main line at Medina. The trunk line proceeds from Villalba towards Avila, and the famous Escorial is reached after thirty-one miles, at El Escorial Station. The vast building, comprising monastery and palace, rises against the background of the mountains; it has sixteen court-yards, nine towers, fifteen cloisters, eighty-six staircases, and hundreds of rooms. The side chapels number forty-eight. Philip II intended it to be a retreat to which he could retire to meditate upon his end. After leaving El Escorial, the line begins to climb towards the summit, which is at Herradon-La-Canada, sixty-one miles from Madrid. There are many tunnels on this section, one of 1,040 yards occurring after the summit is passed, and penetrating the saddle between two ranges of mountains. Navalgrande Tunnel, sixty-four miles, is 1,041 yards long, and divides the basins of the rivers Tagus and Douro, which flow east to Portugal, reaching the sea at Lisbon and at Oporto. Passing through two more tunnels, the track crosses a steel viaduct, and begins to descend to reach the historic town of Avila, seventy-five miles from Madrid. Mountains surround the town, which is cold in the winter. The next town of size is Arevalo. The track continues to descend to Medina del Campo, a town of 9,000 inhabitants, 128 miles from Madrid. The line from Segovia joins the trunk route here. Medina is an important junction for the lines of the National Western of Spain Railways. One of these runs south-west to Salamanca and the Portuguese frontier; another runs west to Zamora. This railway has also another branch from Salamanca, joining the Northern line at Avila. The next junction is at Valladolid, 155 miles, a city of 77,000 people and the capital of a province. Here the line of the Madrid, Saragossa and Alicante Railway passes across the trunk line of the Northern Railway. Beyond Valladolid the line climbs again. Venta de Banos, 178 miles, is the junction for the Northern line which branches off to the west to serve Palencia, Leon, Oviedo, Gijon, Santander, and Corunna. IN BILBAO. A wintry scene in the northern Spanish port. Bilbao is the centre of a network of local lines, and the city has also main-line connexions with Santander, Vitoria, and San Sebastian. Important iron ore traffic is dealt with here. 40,000 inhabitants. The cathedral is one of the most beautiful in the world, and there are many other churches, while the art treasures include a copy of the Mazarin Bible printed by Gutenberg and Fust in Maguncia in the fifteenth century. A branch of the Madrid, Saragossa, and Alicante Railway intersects the trunk line here, providing routes to the Mediterranean and the Bay of Biscay. The line continues to climb as far as Quintanapalla, 240 miles, a little village which, except for La Canada, is the highest point on the line between Madrid and Paris. Three tunnels, the first of which is 1,139 yards long, take the line across the watershed of two rivers, and the track descends to Briviesca, a little town founded by the Romans. At Pancorbo the line goes through a narrow pass in the mountains, and, with the gradient in its favour, runs on to Miranda de Ebro, 285 miles, a junction for the Northern line that crosses Spain from Tarragona to Bilbao. The gradient is adverse for some distance, and follows the River Zadorra until near the city of Vitoria, 306 miles. The line continues through mountain-ous scenery to Alsasua, 333 miles, a junction for a branch line to Pamplona. The line from here to the frontier has been electrified. 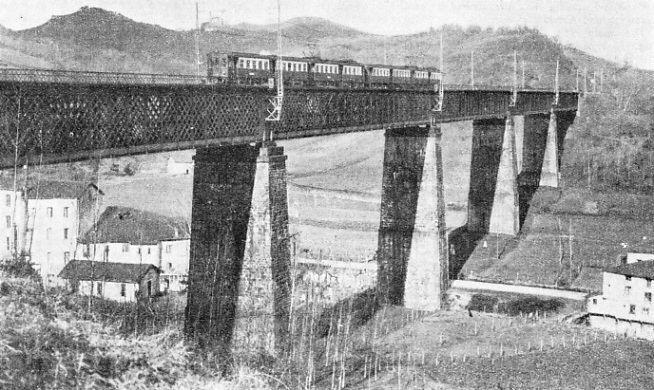 Bridges take the track towards the tunnel of Otzaurte, 1,268 yards long, which at an altitude of 2,004 ft pierces the mountains on the way to Cegama, 339 miles. Here begins a series of tunnels, one being 10,121 yards in length, as the line begins the descent from the shoulder of the mountains to gain its way round the Pyrenees by following the coast. Zumarraga, 352 miles, is the junction for the Basque railways. The track leaves Zumarraga by a tunnel, and passes through the basin of the River Ormaiztegui. It then penetrates several heights by means of five tunnels, crosses the valley by a viaduct, 310 yards long and 115 ft high, before reaching Ormaiztegui, 357 miles. It traverses the valley of the Oria River to Beasain, 361 miles, where there are railway workshops. This part of the track continues to be a succession of tunnels and bridges which show the difficulties the pioneers had to conquer. 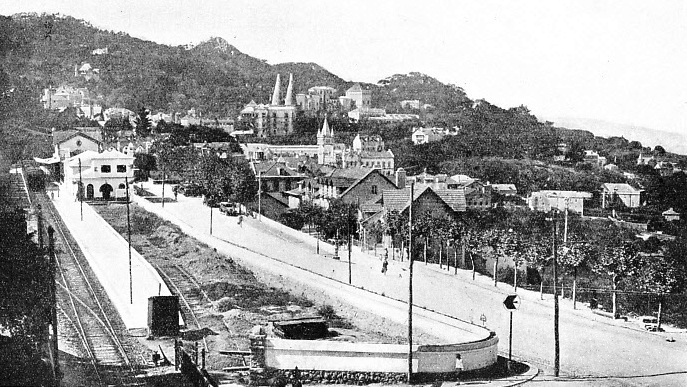 Easier ground is reached at last, and, after another tunnel and bridge, the line reaches San Sebastian, 387 miles, one of the most famous resorts in Europe. It is a fine city of 60,000 inhabitants, and its only rival on the Bay of Biscay is Biarritz, across the border. Both resorts are in the country of the Basques, the remarkable people whose origin has been the subject of much speculation. San Sebastian began as a small fishing village with a wall encircling it, and it was not until 1863 that the people decided to risk removing the walls. Dona Isabel II of Spain had an underground passage built to the beach from one of the principal hotels at which she stayed. Electric rail-cars are used on this part of the line for local services, the electrification of the line enabling excursionists to be carried more speedily than in the days of steam trains. The line now follows the coast. Pasajes, three miles beyond San Sebastian, is an interesting port which, in the old days, was so famous for the prowess of its rowing women that Philip IV selected a crew of twelve to row his boats in the Retiro in Madrid. Irun, 397 miles from Madrid, is a frontier town on the left bank of the River Bidasoa. This is crossed by an inter-national bridge, on the farther side of which is the French town of Hendaye, which is 399 miles from Madrid. Here the French train is waiting to begin its journey to Paris. ON THE NORTHERN RAILWAY OF SPAIN. A 4-8-2 locomotive used for fast goods and heavy passenger trains. 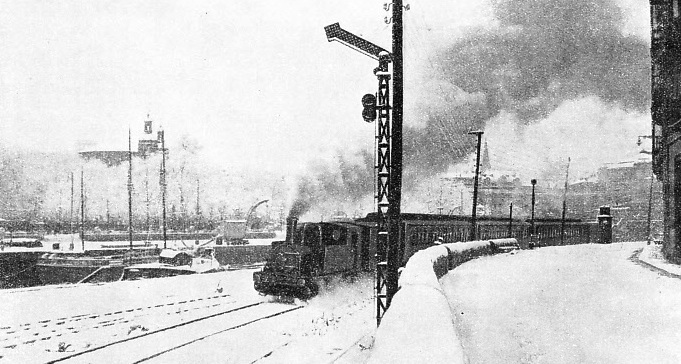 The 4-8-2 type is popular in Spain; and many engines of this type in operation on the Northern Railway were constructed in Germany. The Northern Railway of Spain has some 1,170 steam locomotives in operation. Some details will now be given of the branches leading from the main lines. The first branch line is that which goes from Villalba to Segovia and rejoins the main line at Medina del Campo, the length of the line being ninety-six miles. It is a line of tunnels and bridges and affords grand views of the Sierra de Guadarrama. Segovia, thirty-nine miles, has a population of 15,000. The Roman aqueduct here has 170 arches and two superimposed stages. It is 889 yards long and 92 ft high, and is built, of blocks of granite without mortar or clamps. Segovia is really the end of two branch lines, as the section from Villalba is independent of that from Medina del Campo, and some of the trains from Villalba go back a distance after leaving Segovia and then cross to the line to Medina by a connecting track. The next branch from the trunk line is from Venta de Banos to Santander, and is 143 miles long. Palencia, seven and a half miles, is the junction for other branches, and is a town of 20,000 inhabitants. One branch runs north from Palencia to Santander. Pozazal, on this branch, eighty-one miles from the junction, marks the summit-level (3,228 ft). Beyond Pozazal there begins the most picturesque section as the line crosses one of the steepest parts of the mountains of Iberica and Cantabria. The gradients are severe. Santander, with 80,000 inhabitants, is one of the best ports on the north coast, and is hemmed in by high peaks which are always capped with snow. The shoulders of the mountains afford many varieties of vegetation and climate. 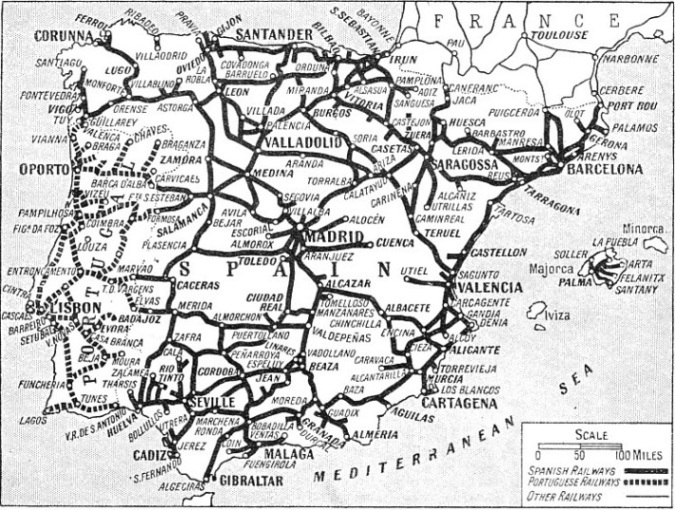 THE CHIEF ROUTES of the railways of Spain and Portugal are indicated on this map. In Spain there are some 10,000 miles of track open, mostly of 5 ft 6 in gauge track. In Portugal the Portuguese Railways Company controls 1,500 miles of 5 ft 6 in gauge track. In both countries there is a considerable mileage of narrow-gauge lines. From Palencia, also, an important section of the Northern Railway goes to Corunna, and is 340 miles long. The first town of importance is Leon, seventy-six miles, where the line turns west through Astorga, founded by the Romans; the town became the key to Galicia. The summit of the line, 3,280 ft, is at Branuelas, 125 miles, and the country is so difficult that there is one loop four and a half miles long which covers a distance of little over half a mile. The loop is necessary to avoid exceeding a maximum gradient of 1 in 50. In tunnels, loops, and curves the line descends the rugged slopes. Monforte de Lemos, 225 miles, once dominated by the castle of the Lords of Lemos on top of the hill, is the junction for the National Western line which runs to Vigo, the port on the west coast. The Northern line turns north after leaving Monforte de Lemos and, helped by tunnels and viaducts, reaches Lugo, 269 miles, a city of 23,000 inhabitants. Lugo is built on a hill overlooking a valley, and is surrounded by a Roman wall, 2,330 yards long, which is one of the most perfect in Spain. After leaving Lugo the track bends north-west. Curtis, 309 miles, is the station from which motor-coaches go over the mountain roads to Santiago de Compostela, one of the most famous places of pilgrimage in Europe. Oza de los Rios, a resort surrounded by pines, affords wonderful views, and on a clear day the Tower of Hercules, one of the most famous lighthouses in the world, dating from ancient times, can be seen in the distance, marking the site of Corunna. Corunna, 340 miles, with 70,000 inhabitants, is a great port and a handsome city. The branch from Leon, on the line just described, to the port of Gijon, on the north coast, is a feat of engineering. The worst section has now been electrified. Going north from Leon, the steam-operated section stops at Busdongo, thirty-three miles from Leon, and 4,167 ft above the sea. From this point to Puente de los Fierros, a distance of nearly seven miles in a straight line, the track is one of the greatest engineering achievements in Europe. The section from Busdongo to Ujo, seventy-one miles long, including the Pajares Incline, has been electrified. There are seventy tunnels in this section, some exceeding 1,200 yards in length, and the curves made ventilation so difficult that formerly the crossing of this section was somewhat of an ordeal for passengers. Electrification has overcome this trouble, accelerated the speed of the trains, and added to their carrying capacity. The scenery is magnificent. The total length of the incline from Busdongo to Pola de Lena is thirty-four miles, and the difference in levels is 3,017 ft. Tunnels occupy nearly half of the section. 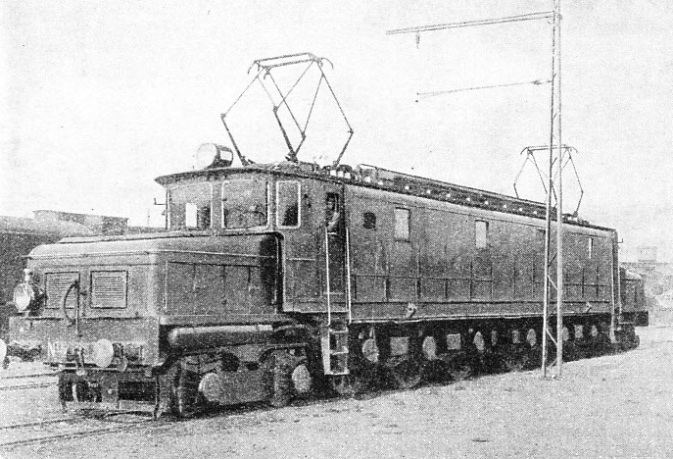 MODERN ELECTRIC LOCOMOTIVE of the type in service on the Northern Railway of Spain. The railway has electrified some of the most difficult mountain sections on its system. After Puente de los Fierros, where a steam locomotive takes over, the scenery changes, and the high mountains are replaced by meadows, and instead of torrents there are steadier streams. Soon the line passes iron and sulphur mines, and then blast furnaces. Oviedo, eighty-seven miles, capital of the Asturias, has 46,000 inhabitants. Gijon, 106 miles, with a population of 90,000, is one of the workshops of Spain, as well as a big port and a delightful seaside resort. It is older than Roman times. The ascent or descent of the Pajares Incline usually takes place in the daytime to enable passengers to enjoy the scenery, the view from Busdongo being impressive. The longest tunnel on the incline is La Perruca, 3,358 yards. The railway from Castejon to Bilbao, 155 miles, travels for half its length through country of an even contour. The fertile plains of La Rioja, watered by the River Ebro, are covered by vineyards and orchards. Logrono, forty-eight miles, is a typical town on the right of the Ebro, which is here crossed by two beautiful bridges. The town is famous for the quality of its wines, and the canning of fruit and vegetables grown in the neighbourhood is a thriving industry. Haro, seventy-eight miles, is the centre of the vineyards which produce the famous Rioja wine. The country now becomes more rugged. The line passes under the trunk route from Madrid to Irun at Miranda de Ebro. At Izarra, a Basque word meaning “Star”, the passage of the mountains that form the dividing line between the Mediterranean and the Atlantic is effected by the Paso de Orduna, through which the train burrows. This most difficult section from Izarra through Orduna to Luyando is about twenty-five miles long, the difference in level of 1,414 ft being achieved by loops, tunnels, and viaducts. Tunnels have been avoided as far as possible and kept to little over two per cent of the distance. The valley in which Orduna stands is surrounded by lofty mountains covered with luxuriant vegetation. Bilbao is a port and industrial city of 188,000 inhabitants, in mining country. The bridges across the river are noteworthy, especially the Bridge of Biscaye. Castejon is also on the branch of the Northern Railway which goes from Saragossa to Pamplona and joins the trunk line at Alsasua. This line is part of the system that extends across Spain from San Sebastian to Barcelona. From Alsasua to Saragossa the distance is 143 miles. The line traverses mountainous country and, some thirteen and a half miles from Pamplona, the train emerges from a tunnel and the scenery changes abruptly. Pamplona, with 29,000 inhabitants, was founded by the Roman general Pompey in 68 BC; hence the name of the city, which lies at the foot of the Pyrenees. Saragossa, with 160,000 inhabitants, lies in a well-watered plain, and is an important junction. Its Spanish name is Zaragoza. Lines of the Madrid, Saragossa and Alicante Railway link the city with Madrid, Seville, Huelva, Alicante, Barcelona, and the route to France via Gerona and Port Bou. CINTRA, in Portugal, is connected by a 15½ miles railway journey to the capital, Lisbon. The above illustration shows a general view of the town. The Northern Railway route from Saragossa to Barcelona is 227 miles long. The line at first ascends the right bank of the River Gallego, coming down from the Pyrenees, and then crosses it, swinging to the right at Zuera, where another line continues up to the frontier station at Canfranc. From Tardienta, thirty-three miles, at the summit of the line to Barcelona, a branch-line runs north and north-west to the Zuera-Canfranc line. Beyond Tardienta the line trends west, and throws off a spur to the north at Selgua. Monzon Rio Cinca is a little place dating from Roman times. From the top of the castle can be seen the two valleys of the Sinca and Sosa, which contain more than sixty towns and villages. Binefar is in the middle of a plain surrounded by hills clothed with olives. Lerida, 114 miles, is a town of 43,000 inhabitants, and is the junction for Tarragona. The country is broken, and there are a number of tunnels before the tram reaches Manresa, a city ot 29,000 inhabitants and one of the greatest textile towns in this region. The line is electrified from this point. At Monistrol a ropeway takes passengers to the monastery of Montserrat, from the summit of which the Balearic Isles can be seen in one direction and the Pyrenees in another. From the train the mountain of Montserrat can be viewed in all its splendour. Nearing Barcelona the train reaches Tarrasa, a commercial city of 40,000 inhabitants, then Sabadell, a town of the same size. Barcelona, a commercial and industrial centre, is the largest city in Spain, with a population of 1,041,900. The port is one of the greatest in the Mediterranean. From Barcelona a branch of the Northern Railway, seventy-two miles long, goes north into the Pyrenees through Vich up to San Juan de las Abadesas. From Ripoli, some six miles before San Juan de las Abadesas, the line branches to Puigcerda, thirty-three miles distant on the frontier. This line from Ripoli is spectacular, electric traction conquering gradients of 1 in 8½, and reaching an altitude of 3,910 ft. The line to Tarragona leaves the line from Alsasua at Lerida, and its length is sixty-four miles. Reus, on this line, is a town of 36,000 inhabitants, and an important manufacturing and agricultural centre. Tarragona, with 35,000 inhabitants, is on the Mediterranean; it has a harbour that is safe and important. There are many Roman remains, including the aqueduct called the Devil’s Bridge (Puente del Diablo) and an Early Christian necropolis. The line from Tarragona to Valencia goes along the coast, the distance between the two ports being 171 miles. Tortosa, with 30,000 inhabitants, is an ancient place; near by is the astronomical observatory of the Jesuits at Roquetas. The line crosses the delta of the Ebro, which here flows into the Mediterranean. It runs through Peniscola, where a castle was built as a refuge for Pope Benedict XIII, and on to Castellon, with 27,000 inhabitants, through Sagunto and Puig, and so on to Valencia, one of the most imposing cities in Spain. From this description of the lines of the Northern Railway of Spain it will be realized that the company operates in some difficult country. Steam locomotives number about 1,170. There are sixty-nine electric locomotives, thirty-eight rail motor coaches, over 1,800 carriages, and over 32,000 wagons. In accordance with the custom in Spain special facilities include the sale of tickets with coupons for trips of from 3,000 to 12,000 kilometres (1,864 to 7,456 miles), first, second, or third class, available for periods from three to twelve months. There are trips at cheap fares on fixed routes which cover the whole or part of Spain on various railways. The Madrid, Saragossa and Alicante Railway possesses over 1,100 locomotives, about 2,900 carriages, and 28,000 wagons. The main lines connect Barcelona with Madrid through Saragossa, and Barcelona with France by the east coast route. They form a network from the ports of Tarragona, Valencia, and Alicante to the capital; while south and south-west of Madrid lines go to Toledo, Ciudad-Real, Cordoba, Seville, and Badajoz, on the Portuguese frontier. Two other Spanish railways of importance are the Andalusian Railways and the National Western of Spain. The mileage of the Andalusian Railways is 1,023. There are 317 locomotives, 680 carriages, and 6,645 wagons. The National Western operates 986 miles, and owns 240 locomotives, 470 coaches, 135 vans, and over 4,200 wagons. In addition, there are numerous small private companies operating broad- and narrow-gauge lines, but the four companies mentioned are the principal railways of Spain. ACROSS THE RIVER LIMA. An important railway bridge which carries a section of the main lines of the Portuguese Railways near the town of Vianna do Castello. There are railway links with Spain on the north, north-east, and east of Portugal. The Andalusian Railways operate in the southern province of that name, and serve famous cities such as Cordoba, Almeria, Granada, Malaga, Algeciras (near the Rock of Gibraltar), Cadiz, and Seville. Cordoba, the capital of the Khaliis, was the Mecca of the West when the Moors ruled Spain, and the mosque was second in size to the Kaaba of Mecca. At one time a million people, Moors and Christians, lived in and around the city. Seville, on the Guadalquivir, claims to be the most Spanish city in Spain. The cathedral, half as large again as St. Paul’s, London, was built to fulfil the ambition of the builders, “to build a church so great and magnificent that those who come after us will think us mad to have attempted it”. Holy Week and Easter in Seville attract visitors from all parts of the world. Granada, the former capital of a Moorish kingdom, was surrendered to Ferdinand and Isabella in 1492, thus ending the power of the Moors in Spain. The Alhambra of Granada is claimed to be the finest example of Moorish art in the country. Bobadilla is the railway junction for lines from Granada, Malaga, Algeciras, Cadiz, and Seville. The line from Bobadilla to Malaga goes through magnificent scenery. After passing twelve tunnels and bridges, the train emerges from the wild gorge of El Chorro to fertile orchards of orange and lemon trees, with palms and cypresses, to ancient Malaga, long frequented by British visitors as a winter resort on the Mediterranean. The National Western of Spain Railways serve the country west and northwest of Madrid to the Portuguese border, linking with the Portuguese lines at several points, and establishing connexions with Paris and Madrid by means of the Northern system. One part of the Western system serves the Atlantic ports of Vigo and Pontevedra, and makes contact with the Portuguese line which runs near the coast down to Oporto. It goes east from the frontier station to Orense, to make contact with the Northern line from Corunna to Leon at Monforte. A line runs south from Astorga on the Leon-Corunna route, roughly parallel with the Portuguese border, to Caceres, after which it trends west for Portugal. Lines of the Western of Spain Railways join the Northern trunk route at Medina del Campo and at Avila. Another line connects directly with Madrid. Salamanca, which is about the middle of the north-to-south line, is the oldest university town in Spain, and the scene of the battle where the Duke of Wellington defeated the French. Portugal, the most westerly country of the continent of Europe, is bounded north and east by Spain, and has an area of 35,490 square miles. The total railway mileage is 2,133; of this 1,534 miles are operated by the Portuguese Railways Company, and the remainder by four other companies. Three of these companies, however, have the metre gauge. But the gauge of the Portuguese Railways is the same as that of the main lines of Spain, 5 ft 6 in. This company has 410 locomotives, nearly 1,000 carriages, 6,600 wagons, and 275 vans. ROCIO TERMINUS in Lisbon, the focal point of the Portuguese Railways, is the central station for the Northern, Western, and Cintra Lines. There are two other stations serving the Southern and South-Eastern Lines and Cascaes. This photograph shows the striking entrance to the Rocio Terminus. Lisbon, the capital, with a population of 587,300, is the great port on the north bank of the River Tagus, and is connected by a railway running north with Oporto, the second city of the country. Oporto lies on the River Douro. The railways of the country follow the coast from north to south, and send lines laterally to the Spanish border, making contact with those railways at a number of places. Lisbon is the focal point of the railways. 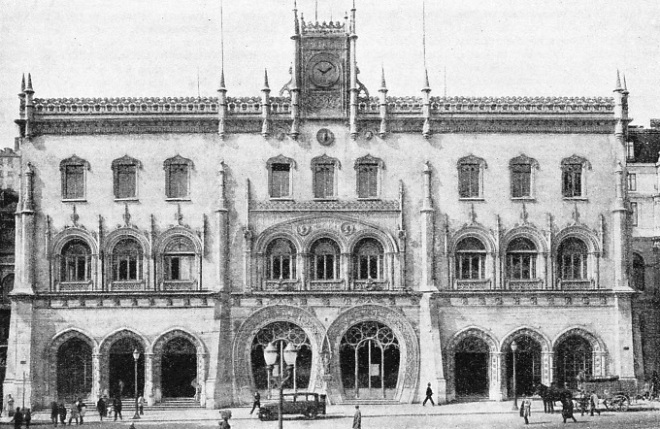 The central station for the Northern, Western and Cintra Lines is the Rocio Terminus, adjoining Dom Pedro Square. There are two stations near the Tagus, one serving the Southern and South-east Lines, and the other the line to Cascaes, which follows the Tagus towards the Atlantic Ocean. Cascaes is a fishing village and seaside resort at the mouth of the river, and near it is the resort of Estoril. The line from Lisbon to Cintra, fifteen and a half miles long, runs to Cacem, which is a junction for the Western Line, and onto the famous resort. Cintra lies between two mountains, on the top of one of which is the royal palace of Pena and on the other the Moorish castle. The Western Line continues north from Cacem, serving a picturesque country, to Leira, with a fine old castle, and on to Figueira da Foz, which is on the coast at the mouth of the Mondego River. At this place the line connects with lines for Allarellos and Coimbra, this latter town being a university city on the Northern Line. It is the Northern Line which connects Lisbon and Oporto. Leaving the capital, the line follows the right bank of the Tagus, and passes olive groves, fields, and pasture lands between Santarem and Entroncamento before it begins to climb the hills among pines. It meets the Western Line at Alfarellos, and affords fine views of Coimbia. Beyond this town there are views of the mountains; then the line trends towards the coast at Aveiro, with views of sandhills and of the sea at Espinho, and crosses the Douro by a fine bridge into Oporto. This line has seven branches between Lisbon and Oporto. Oporto is the great port for wine, and is well served by railways. The line to the north, called the Minho Line, goes to the Spanish border through country where maize fields, vineyards and rivers catch the eye. It follows the coast for some distance and crosses the Minho River by an international bridge and reaches the Spanish frontier at Tuy, on the line to Vigo. There are three branches on this line. The Southern and South-Eastern Lines begin from Lisbon with a steamboat journey across the swift-flowing Tagus to the south bank. Leaving the ferryboat for the train, the passenger for West Alemtejo goes to Setubal, famous for the excellence of its grapes, and on to Tunes, from which a branch goes to Lagos, on the south coast in the direction of Cape St. Vincent. The line from Tunes follows the coast to the Guadiana River, which forms the frontier. The passenger is taken to the Spanish side by steamboat. Another line leaves the former line between Barreiro (the ferry station on the south bank of the Tagus) and Setubal, and goes cast to Vendas Novas, where a branch connects it with the Northern Line and runs to Casa Branca. From this point one line goes to Beja and to Funcheira and Tunes, and another to Evora and Vila Vicosa. The Southern and South-Eastern Lines thus serves the Alemtejo and Algarve Provinces. The Alemtejo Province has few hills, and is an agricultural district with forests of cork trees; the Algarve province, which forms the south of Portugal, is hilly. The lateral lines lead to Spain. On the Northern Line the junction is at Entroncamento, for the Eastern Line which goes to Spain via Badajoz in the south-east, via Valencia de Alcantara in the east, and via Guarda and Fuentes de Onora to Salamanca in the north-east. From Oporto a railway goes east through Tua to Barca d’Alba, and so into Spain via Salamanca. Among the most recent locomotives introduced on the Portuguese 5 ft 6 in gauge lines are some efficient 4-8-0 compound locomotives. There are also a number of “Pacific” type engines in operation, and some of these are used for working principal express trains at an average speed of over fifty miles an hour. PORTUGAL HAS 2,133 MILES OF TRACK open, of which two-thirds are operated by the Portuguese Railways Company, and the remainder by tour other companies. Above is a section of line at the holiday resort of Estoril, a few miles west of Lisbon. You can read more on Spanish electrification in “Electrification in Europe”, “Speed Trains of Europe” and “Through Southern France” on this website.